Crossbow is the first radio-controlled, flapping-wing aircraft kit with a sleek fiberglass fuselage and modular gear unit. 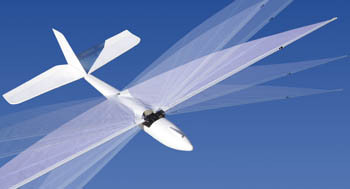 The Crossbow RC ornithopter has a unique, high-efficiency wing design, giving it excellent performance in flapping and gliding flight. The Crossbow's 68 inch wingspan is the same as a turkey vulture or osprey, making this RC bird look awesome in the air! The Crossbow RC ornithopter (flapping-wing aircraft) was designed for efficient flight. The pre-sewn fabric wing has a rounded leading edge and cambered profile. Unlike earlier RC ornithopters that had an unreliable "glide lock" mechanism, the Crossbow RC ornithopter will glide every time you cut the throttle. The Crossbow RC ornithopter kit does require assembly. You can tell people you built it yourself. It comes with a detailed and clearly illustrated instruction manual. The Crossbow RC ornithopter is recommended for those who have some prior experience building RC planes, and experience flying with ailerons. The Crossbow RC bird kit is made in America. Crossbow requires a 2000mAh, 7.4 volt lithium battery, a 10 amp brushless ESC, and an RC system with two Hitec HS-55 servos or similar. The AXI brushless motor is now included in the kit!